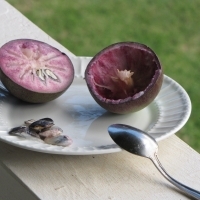 A purple skinned variety with translucent flesh. 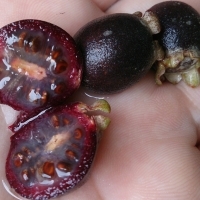 The delicious sweet fruit has flavours reminiscent of grape and melon, however, fruit should be well-coloured and mature, as immature fruit are sticky with latex, especially near the skin. 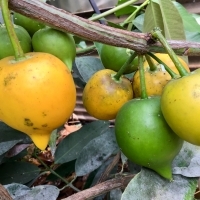 Star apples are very attractive as an ornamental specimen tree. 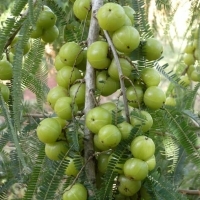 A medium to large evergreen tree, its weeping form and glossy, velvet, green leaves, with a gold underside, gives the tree its ability to change from green to gold with a small wind. 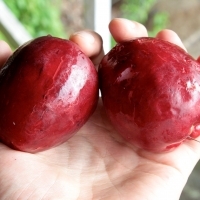 Cherry sized fruit with a red to yellow skin and a juicy, slightly tart white pulp. Highly esteemed in Borneo. 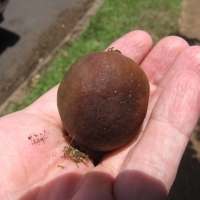 Small or medium sized tree a bit like the mangosteen in appearance. 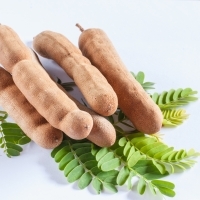 Eaten fresh out of hand or dried and used for flavoring other foods. Suited to tropical areas only. Very rare and endangered tree from Southeast Asia. 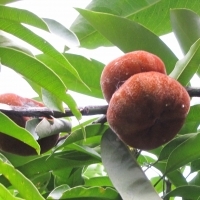 Fruit is borne on the lower trunk and has a coconut/mango flavour. 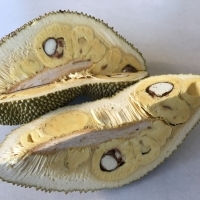 Suited to tropical areas only.Ancient Indonesians believed that eating the fruit would cause body secretions to take on a perfume scent. 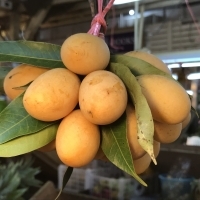 Skin glossy, smooth, gold colour over green; fruit medium sized, spherical; flesh white; seeds 2-4. More cold tolerance than purple varieties. A selection made from Alan Carles importations. 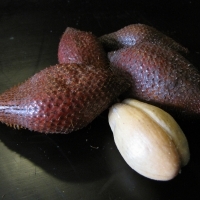 A fruit somewhat resembling the langsat is sweet-acid flavored appreciated in parts of Southeast Asia. 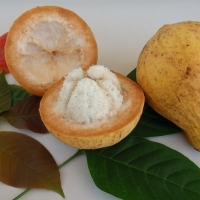 Fruits grow to 50mm, with a yellow-brown skin and white pulp. 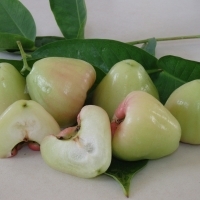 They may be eaten raw or cooked or made into jam or wine. A large tree to 18 m tall with a dense crown and straight trunk. 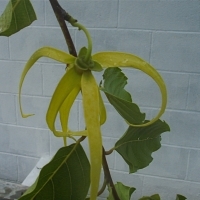 The small cream flowers are followered by the elongated 10 cm long yellow fruits. 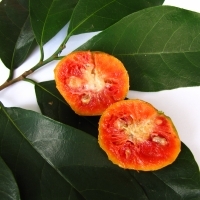 The edible skin surrounds the sweet or sour orange to red flesh. 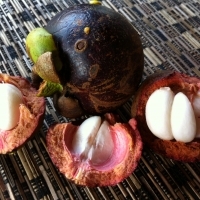 Uses: Maprang fruits, especially the sweet varieties, are consumed fresh or eaten cooked in syrup. 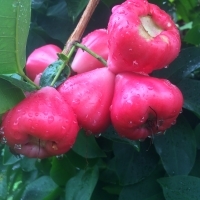 Entire immature fruits are chopped and used as an ingredient in the spicy condiment sambal, and are pickled to prepare asinan. Young leaves are also consumed in salads and eaten with sambal. An early season mango with a moderate yield, a selection bred in Queensland. 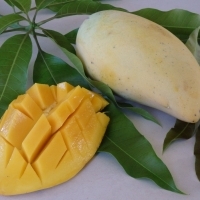 A long thing mango with pale skin that ripen with a bright blush. The flesh is smooth and sweet with a hint of old fashioned turpentine near the skin. 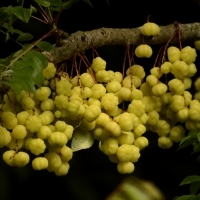 Native to the Philippines this highly ornamental tree fruits along its branches. 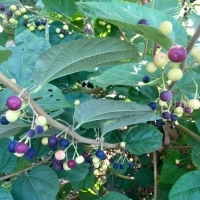 The new growth is pinky purple and the fruits are dark purple - almost black and subacid. 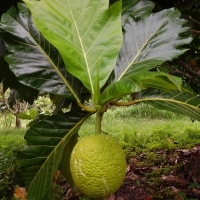 Medium sized tropical tree, growing 12 - 20m. 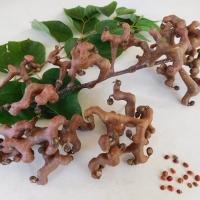 Red leathery skin is covered in fleshy soft spines giving it a hairy look. Flesh is translucent, white or pale pink with a sweet mildly acid flavour. 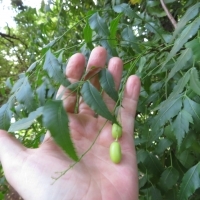 The soft seeds are poisonous when raw, although they can be eaten when cooked. 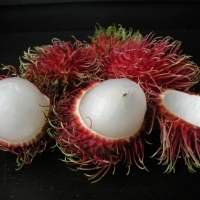 Trees are very cold sensative and are only suited to the tropics, we only recommend rambutans for tropical Queensland. 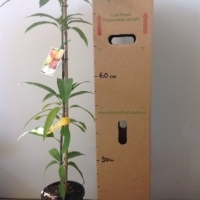 Superior grafted selection of Kensington Pride (Bowen Mango). Fruit medium size, orange yellow blush early, very sweet. A small tree that bears large edible berries of dark purple to black and is similar in texture to a European plum. Seedling plants can be used to create an impenetrable hedge due to their formidable thorns. 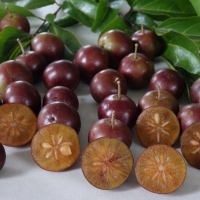 This purple fruiting selection was made in Florida in 1952. 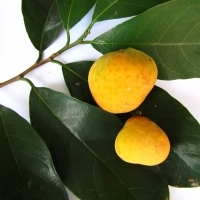 A heavy yielding tree with well-formed and very high quality fruit. Highly ornamental tree with its attractive brownish underside leaves. Not suitable for temperate climates. A small tree that bears large edible berries of dark purple to black and is similar in texture to a European plum. Cutting grown plants are thornless and true to type. 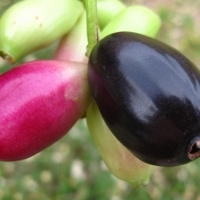 The small fruits have a plum-like flavour. 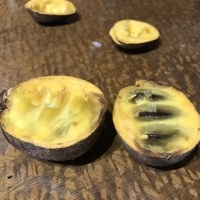 The fruit is a tennis ball size, purple and of a very good quality. Originated as a seedling of Haitian. 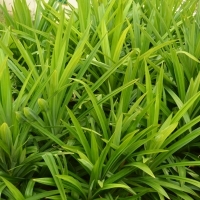 Attractive weeping foliage. A popular selection in Asia, the sweetest selection. 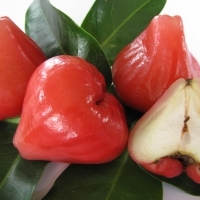 Very similar to the Red Wax Jambu however has white waxy skin and is sweeter, but it is much more cold sensitive. Fruit is apple sized, purple or green skin, with semi-translucent flesh that is soft and juicy. Flavour is sweet and delicious. 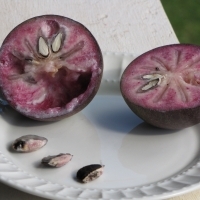 A pink fleshed variety. Not suitable for temperate climates.